Cosmetic therapy professionals consider Solta Medical Fraxel SR1500 a gold standard in the field of non-ablative, fractional medical lasers. The SR1500 represents an upgrade to prior Fraxel models. Fractional laser works by dividing a single beam into thousands of tiny beams. Each minute beam creates a treatment area on the skin- a microthermal zone. The laser treats the discrete microthermal zones, but not the surrounding areas. The untreated zones help the microthermal zones heal, speeding up the pace at which the skin resurfaces. A refurbished Fraxel SR1500 features an enhanced optical zoom to help therapists reach deeply and accurately into the microthermal zones and control the laser dosage with precision. By reaching deeper into the skin, the methodology stimulates production of fresh collagen; the new collagen promotes the skin’s ability to heal itself. Physicians appreciate the Intelligent Optical Tracking System built into SR1500. The system detects the speed at which the operator works, and automatically adjusts to assure an optimal treatment. 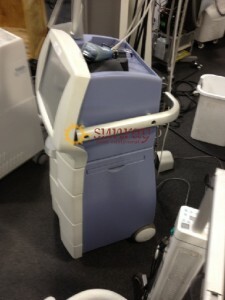 The Fraxel SR1500 is one of the many outstanding Solta Medical skin rejuvenation devices SunrayLaser.com has been pleased to carry. Expert technicians inspect and refurbish each Fraxel SR1500 we handle. Every unit is guaranteed to perform to the rigorous safety and operational standards specified by the manufacturer. Our goal at SunrayLaser is complete client satisfaction. Let’s talk about how the Fraxel SR1500 can help your practice add new patients. Please fill in the form below and a representative familiar with the entire Solta Medical lineup of quality cosmetic lasers will contact you as quickly as possible.